The farm house is located on the Mont Chery, a 5 minute drive or 15 minute walk from Les Gets. It has a wonderful open plan living room, dining room and modern kitchen - perfect for spending time with family and friends. The double height dining area gives a tremendous feeling of space. There is a wood burning stove and a TV with UK and French channels. There are two balconies to the east and south with views over valley. There are 6 bedrooms (5 rooms are en-suite). There is a separate laundry room and plenty of space for sports equipment. We also have a two bedroom apartment on the lower ground floor of the Farm for a smaller party or in combination for larger groups. This separate apartment has an open kitchen, dining living room and WC. There are two en-suite bedrooms. One bedroom a king bed and the other has a bunk bed and one single. There is a laundry room and plenty of space to store skis. We have wifi. We have enjoyed winter and summer holidays in Les Gets since 1996. We chose Les Gets as it is a French village which is great for families with young children and teenagers. Very spacious with excellent views. Comfortable for multiple families or a group of adults. All bedrooms are large and have en-suite bathrooms. Extra storage for sports equipment skis, bikes and golf ! 90sq.m living/dining room - mostly double height space. Large flat screen TV with home cinema and UK satellite. Wood burning stove. Attractive leather furniture and dining seating for 14. Kitchen contains range style cooker with 5 burner gas hob and large electric oven, Large fridge freezer, dishwasher, microwave, full complement of cooking equipment, crockery, glassware and cutlery. The house is a three minute drive from the lifts and centre of Les Gets. Located on the Mont Chery side of the village, it is possible for a good skier to ski in and out when sufficient snow. Les Gets is a point of access to the vast Portes du Soleil region and offers a huge variety of skiing for beginners to experts. The village is full of Savoyarde charm with shops specialising in local produce, a good range of restaurants and plenty of ski shops. Within 5 minute drive from Ferme du Lavay are the municipal courts for Les Gets. No cost but best to reserve ahead. Within 15 minutes drive from Ferme du Lavay discover Les Gets sumptuous 18-hole golf course, with its unforgettable panoramic views. Take advantage of pure relaxation time with views over the Mont Blanc at the heart of the pine forest! . Notes on accommodation: The property is ideal for two or more families sharing. It is well equipped and offers plenty of entertainment systems. It is warm and well heated with lovely views. Its hotel-style bathroom and powered showers enable all eight showers to be pumping at once with no loss of hot water. Outside: Two terraces to the east and south, one covered with a barbecue. Utility Room: Washing machine and dryer, hanging space and ironing facilities. Cleaning / Towels / Linen / Housekeeping service: Towels and linen are included and changed weekly. The property is cleaned weekly. Other: Large ski/boot/cloak room with ski racks. We recently had the pleasure of staying in this property for 4 nights. From booking to check out, the owners couldn't have been more helpful with advice on ski hire, lessons and local restaurants. The house was well equipped and comfortable with a full kitchen and open plan living space. Perfect for large groups & family's. Always had hot water and the log burner keeps the house nice and cosy. Even the 20-25 minute walk to the lifts is great for warming your legs up (or curing a hangover) and if you hire ski's, you can leave them in the ski shop so don't need to carry equipment up and down twice a day. Also it's a 5 minute drive and plenty of parking in the town. Would certainly recommend this property and I'd 100% stay again if (when) we return to Les Gets. Myself and 10 friends stayed in the house for a long weekend while mountain biking in Les Gets and Morzine. The area is obviously just amazing. The house is extremely large with an amazing big living room/kitchen area. It was the perfect base for our holiday with loads of room to spread out, comfortable beds, loads of hot water for showers all at the same time. Great views. We would definitely stay there again! Auch für einen MTB Urlaub in größerer Gruppe perfekt geeignet. Das Chalet ist sehr gut ausgestattet und bietet viel Platz. In der großen Garage können Bikes gut verstaut werden und die Vermieterin ist sehr freundlich. Das Chalet ist über das Liftsystem gut erreichbar. Location conforme à ce qui est décrit dans l’annonce et propriétaires au top! Bonjour, nous avons passé un agréable séjour à la ferme du Lavay. La location est spacieuse et conforme à la description. L’espace de vie est spacieux et les chambres assez grandes. Nous étions 17 personnes ( 8 adultes et 9 enfants) et nous n’avons pas eu l’impression de se marcher dessus, comme souvent dans des locations d’hiver. Une navette dont l’arrêt se trouve à 100 m du chalet, permet de descendre/remonter au centre-ville des Gets et du télésiège des Chavannes. De plus, Loretta la propriétaire est très sympa et très réactive à la moindre question. Je recommande vraiment cette location familiale . 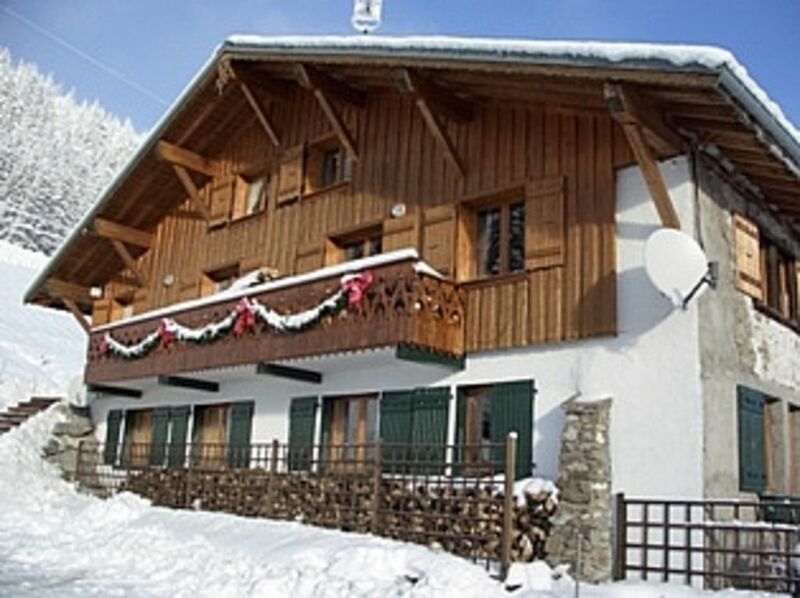 Superbe chalet dans lequel nous avons reuni 17 membres de la famille de tous âges pour Noël. Loretta très disponible avant notre arrivée pour repondre à toutes nos questions. Le salon a été le théâtre de moments mémorables et la proximité avec la station rend l’accès aux pistes très facile. A recommander !! Nous avons passé un séjour très agréable dans ce tres spacieux chalet. Il est tres confortable et bien équipé. Nous recommandons vivement ce logement. We are one hour from Geneva Airport or 2.5 hours from Lyons. If driving from the UK, we are nine hours from Calais. Use of a car is preferable whilst there. The house is a 3 minute drive from Les Gets centre. Booking Notes: A booking is secured with a 25% payment. The final 75% payment and damage deposit are due one month before departure. Changeover Day: Changeover days are flexible except at the half term weeks when we normally change over on Saturdays to match the ski school dates.